The phrase "Tuesday night runs" to many people may not have the best memories, but for the over 100 people that have been coming to Tuesday Night Runs at the Fleet Feet in Lawrenceville lately, it is a phrase that will hold many fond memories. I want to be careful to not talk of the Tuesday Night Runs, or the Tuesday night runners in past tense. There will be many more humid, sweaty, stinky (everyone else but me), and fun Tuesday night runs in the future, and even if (which they won't) the runners begin to dwindle over time, there are many friendships that have formed over the past few years that will no doubt bond for a lifetime. 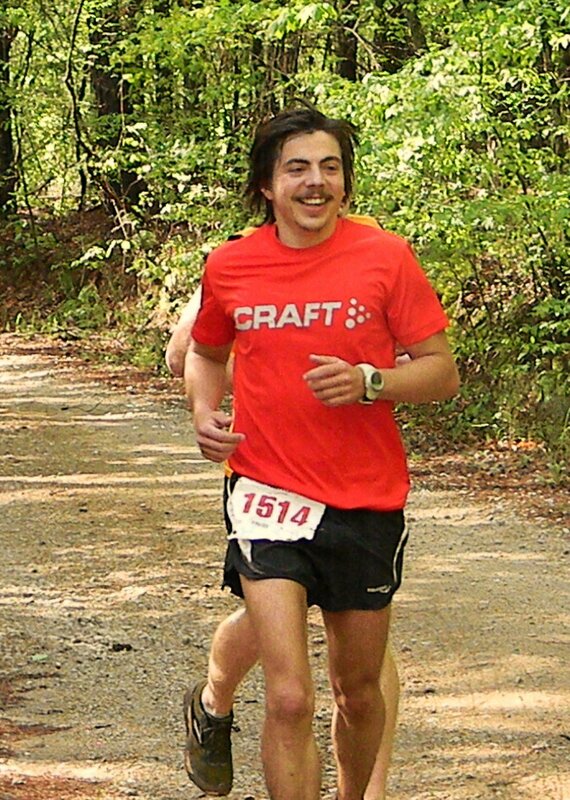 To many Trey Bailey is just another Hippie, to others he may be a Steve Prefontaine wannabe (I don't see it), but to the rest of us he is just that crazy guy that wears womens running shoes, sometimes dresses like them, and oh yea is a killer Group Run Leader. We never knew quite what we were going to get into week to week. It may be an easy run, a tempo run, intervals both on the roads and on the track, cross training mid run, or hill repeats - both the boring kind and the kind you do while being clocked by the local law enforcement laser guns. We did know, however that it was going to be fun, even though sometimes it was difficult. 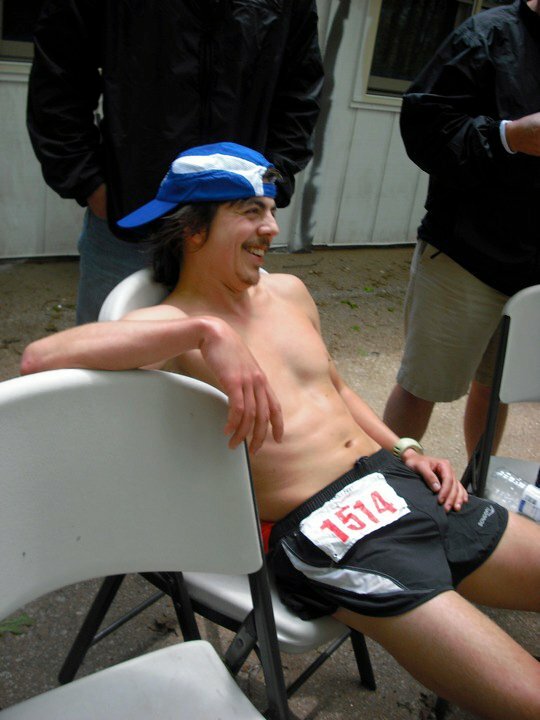 Trey never lacked encouragement for all the runners of all abilities, and was there each and every Tuesday even while dealing with an injury that kept him from enjoying the sport that he lives to participate in. Trey has since healed and is back to running, just recently running his first 50k, so he can now be called an Ultra-Marathoner. This return to health has also helped him further pursue his love of running while taking it to a new level. He will be leaving us officially this past Tuesday to pursue those dreams at the base of some small mountain out in Seattle. He will be missed, and I don't say this lightly. He has and will leave behind him a new love of running in many people that ran their first mile, or their 3,000 mile while he either ran or drove past to encourage them. Many of us will hopefully keep in touch and see where life takes him, although we all know it will be down a trail somewhere running nearly barefoot. I suggest you take a look at his blog, Uphill Running, and make sure you follow it! While you are at his blog I suggest you follow it as well to make sure you don't miss anything he posts. He can also be found at his new Twitter account @uphillrunning, or his Facebook Fanpage, but if you want to read what really makes him tick you should follow his blog. I do feel like I have to disclose something (please excuse my pleas and begging). 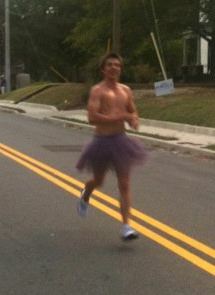 I made a challenge with Trey that says he needs to break back out that Tutu for next week when he comes just to run with group one last time. This is all well and good, but he said he would only do that if he got 100 followers on his blog. I am pretty sure we have doubled (or nearly) his followers over the last 24 hours so this shouldn't be too tough. You can play a part as well by following his blog, just be glad you are not the one that has to run behind him while he is wearing it! Oh, and by the way... tell him I sent you. Awww... sounds like a fun guy, and a fun running group. Great read! Sweet, Tim. Wish I wasn't having to collect money at the Gate for Region next Tuesday. He really is a very charismatic, friendly guy. I wish him all the best! I met Trey after meeting you via Twitter and have learned much from both of you. I am just now coming up on my 1 year anniversary as a runner and will miss all of Trey's great advice and encouragement at Tues Night Run Group. It'll be weird (at first) not having him there but I'm sure the new Run Leader will do a great job carrying on in his stead. Trey is responsible for bringing lots of runners together which led to many friendships and tons of valuable information sharing and I can't thank him enough for that. End of An Era? Really Not. He has established a legacy and is moving on! They say your accomplishments are not counted by the money you had but how may lives you changed!